What's is this obscure 1970's bit of kit from a big name manufacturer? Looks like it was used with a 5890 Gas Chromatograph. In the early 1990's I managed an analytical chemistry group that was responsible for several rooms full of these on both gas and liquid chromatography systems. They were connected to a HP-1000 minicomputer via a multiplexed serial bus. The data connectors were known as "Grenoble Connectors", as I remember. I was not hands-on for this system (thankfully, it was old even then) and I have reached out to one of the people who was hands-on at the time in case there are other interesting points. I'm sure it was capable of being used with all sorts of lab equipment. 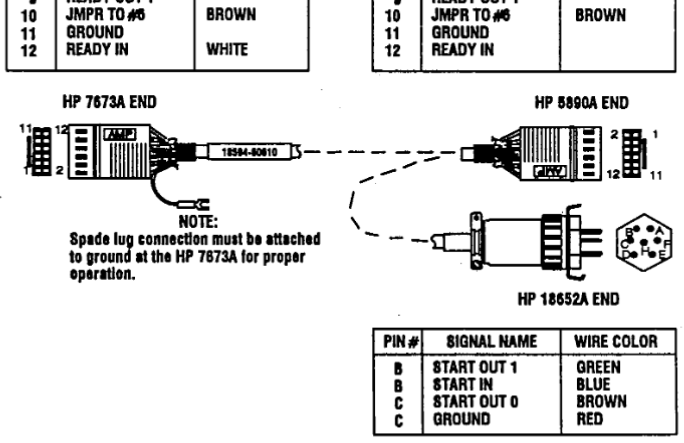 The HP 1050 Series Variable Wavelength Detector manual from 1992 talks about remote cable part numbers to connect an 18652A as well as analog output cables and a note that the output from the 1050 series can be configured to be 100 mV or 1 V maximum signal output. The HP 3354B lab automation system also mentions the 18652A. The 3500 series manual talks about the card-edge cable to go to the 18652A and says it is 1V input. Dunno what the insulation is but HP was using glass asbestos for some things in the 70s, so caution maybe be in order. I see it was used with another model HP 1090. Also in the Agilent 1049A Electrochemical Detector Operators Hanbook. As I am looking at all this stuff The Tornados Telstar springs to mind. The HP 1090 was one of the most common liquid chromatographs, but the 18652A ADC box was used with many manufacturer's systems since it just got the analog signal from the detector. By the 1990's almost all pharmaceutical and agricultural analysis chemical separation was done with liquid chromatography (rather than the previously mentioned gas chromatography). It was common to mix and match the components (auto-sampler, pump, column, detector) with pieces from different vendors. There was nothing that tied the 18652A ADC to any specific HP product on the input side. The HP-1000 based LAS (Laboratory Automation System) had the model number 3354B that presumably incorporated the HP-1000, interfaces, acquisition and analysis software. It was common to mix and match the components (auto-sampler, pump, column, detector) with pieces from different vendors. There was nothing that tied the 18652A ADC to any specific HP product on the input side. Yes, there are numerous references to the 18652A in other, non-HP manuals and papers citing various mixes of apparatus. It was probably originally designed fairly soon after HP acquired F&M Scientific in 1965, just about when doing things like programmable temperature control was becoming a thing. Electronic data capture and analysis was the next logical step instead of chart recorders, etc. and I'm sure HP's expertise in those areas provided significant, rapid advances in the equipment of the era. Next would be the automation of sample processing, etc. Could the analog section be a precise voltage-to-frequency converter - and the rest of the device essentially a counter that counts pulses when triggered for a new A/D conversion? It would also send the result out as a serial data stream on the output port. 14 bits / 84dB range seems achievable with this method and would be considered very high performance in the 1970's. i would love to see Dave power this bad boy up and see if we can determine some basic specifications. It shouldn't be that difficult to power it up, feed it a voltage from 0-1 V on the analog input, put it in RUN, and see what it spits out the other end. It should be relatively easy to probe with modern test gear and it probably still works. Was used in the HP1000 series, and I did use one ( and repaired mercury relay boards on it) that was part of a room size ATE system. Was used IIRC as one of a couple of ADC units that measured power supply voltages fed to the UUT, while the precision voltmeter ( it had a Nixie or Panaplex display, buried in the rack) did the precision readings, along with the synchro to digital converters, and the AC converters, to get the high resolution (14 bit) data. The output is designed for transformer coupling both ends, and the input is fed to a transformer (Pulse one with a center tapped primary, and a 93R impedance secondary) that feeds a 7474 flip flop, biased so that the pulses set and reset the output, giving you the recovered data signal. IIRC 470R to Vcc, center tap to that and a 330R to GND, biasing the input nicely in the middle of "don't care" space, with the pulse amplitude alternately driving the input stage into conduction on the negative edges. Replaced a lot of 5474 IC's in that position, they did not like being driven above Vcc on the edges, and would eventually have enough threshold shift to stop recovering the data reliably. Remove the IC, place in a test jig and it works perfectly, but you find the high threshold is now 1V or so, and the gate input current is around -5mA. We had tubes of them around, but is is a standard. I have been corrected, 3354B was actually a model of the HP-1000. I think that it had arrived shortly before me in 1983 and I remember the guy who managed it calling it "a Ferrari", compared to the previous system. We moved to a Model A990 HP-1000 in 1992. "The 3354B had a whopping 2MB of main memory and would boot from almost anything that HP had on the HPIB bus. The computer didn't even have a main board, it was three boards that all worked together. HP built this thing for their own test purposes (the Real Time Executive operating system was hardware-interrupt driven). It supported four current loop cards that with 15 18652A devices each (last address was reserved for broadcast) so it would handle up to sixty chromatographic detectors. I think we were close to that number. User response sucked though, until we got the A990. That was a righteous RTE system. That handled five loop cards and I wrote the spooling routines that finally freed up a lot of the user sessions. I swear I could have emptied the magazine of a .45 into one of these things and it would still take data." We did modify the 18652A boxes so that new samples would not be injected if the data system was unreachable. Back in those days data were stored in proprietary format binary files and people were just starting to worry about data portability into the future. So, we developed software to convert the HP binary files into a proposed industry standard using NetCDF. I'm giving a portion of a talk on NetCDF in December where I will show that I can read and plot one of those data sets from 1995. The rest of the talk will be by someone else on how NetCDF is used at NASA and NOAA. Apparently the chromatography community now has some XML based common file standard.